Skin Nutrition is a revolutionary skin care brand leading the way in bio-active skin care, specializing in anti-aging, age reversal, and skin rejuvenation. Skin Nutrition is absolutely committed to the development of skin care products that deliver maximum efficacy and results. We are able to achieve this by taking a radically different, bilateral approach by utilizing "leading-edge", technologically advanced ingredients and delivery systems, many of which are proprietary and patented, that penetrate the epidermis to work from the `outside-in'; proprietary nutritional supplements that work from the 'inside-out'; and lastly, we ensure every ingredient we use is compatible with our bodies natural biological processes. Sadly, this is not the case with many of the skin care products out there today. Many use 'so-called' actives that are simply not bio-compatible and are unstable in the forms they use, creating no efficacy whatsoever , and many still use mineral oil for their base emulsion, which prevents penetration of any active ingredients and disallows the skin to breath. Why would they do this? For the simple reason that these types of ingredients are far cheaper than the ones that are bio-compatible and have efficacy. The Skin Nutrition synergistic strategy reverses cellular inflammation and glycation internally where premature ageing starts, promotes cell and fibroblast reparation and renewal, stimulates skin stem cell proliferation, and repairs and reverses the visible signs of ageing on the surface of the skin. 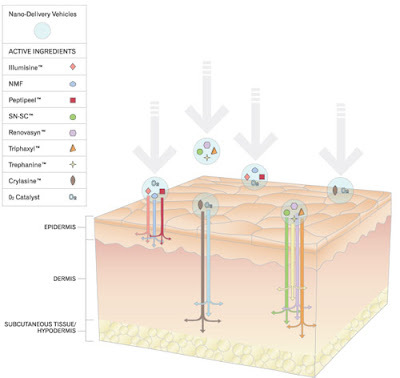 Imagine a skin care product that is so intelligent it mimics our body's own biological process of making new cells. Imagine a skin care product that every time you use it provides your skin with the identical elements that replicate a new cell. Imagine a skin care product that counteracts the signs of the aging process and never slows down like our own biological processes do as we age. Imagine no longer. Our skin is made up of multiple cells, which consist of complex elements, and these elements all have roles to play in ensuring optimal cell and skin health. This biological process is genetically engineered to run like a finely tuned machine and pretty much does so without disruption in our early years. As we age however, what is not factored into the equation is damage we do to these elements by lifestyle and environmental aggressors, which not only ages us prematurely, but slows or stops cell production, and hinders the cells from doing what they are there to do. Cell-CPR™ with SN-CRT™- Cell Replication Technology is, like a healthy new cell, made up of phospholipids, proteins (enzymes, oligopeptides, and amino acids), oxygen, the components of cytoplasm and mitochondria, ATP, vitamins, and minerals. It is designed to work synergistically with our body's natural biological processes and not only mimics our cells, but stimulates the body to naturally produce new cells. Cell-CPR™ contains additional proprietary ingredients that protect, repair, and stimulate skin stem cells, cell membranes, and DNA; increase the synthesis of collagen and elastin, promote the turnover of the outer layer of the skin, reduce cellular inflammation, inhibit pigmentation disorders, and increase oxygen respiration in the skin. Phytosterols - plant sterols that support the renewal of the skin's natural protective layer. Omega Plankton - High quality source of Omega 3 and EPAs and DHAs. Combats inflammation by reducing the NO (Nitric Oxide) radical, stimulates Ceramides, rebuilds the skin's natural protection, and provides a lasting seal by increasing hydration of the epidermal layers. Photosphingosine - a lipid residing in the Stratum Corneum (the skin's outer-most layer) meant to protect internal organs from the outside environment. When it is damaged it is not able to function correctly. The supplement of this in Cell-CPRT supports the biological function and is a key biochemical precursor (building block) for Ceramide 3, 6, and Phytoceramide 1, which all improve skin barrier function. Ceramide-2, 3 & 4 - protects and repairs the barrier and inhibits melanin synthesis. ATP (Adenosine Triphosphate) - a bioactive complex to provide energy for the cell. It has high water retention properties, improving skin moisture, wrinkle smoothing, and skin tightening. Polysaccharides - rapidly reduces the appearance of wrinkles and inhibits skin irritation. 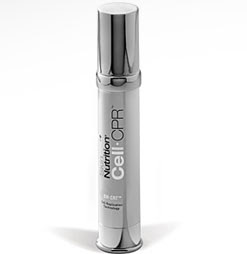 Skin Nutrition Stem Cell Complex - a plant stem cell to protect and stimulate our skin stem cells. Protects cell longevity and the cell against UV damage. EGF (Epidermal Growth Factor) - promotes epidermal cell proliferation. reduces and prevents lines and wrinkles by generating new skin cells. A peptide that creates youthful skin by increasing the turnover of the Stratum Corneum (the skin's outermost layer) without thinning the skin like chemical peels and AHAs do with prolonged use. A skin depigmentation and radiance boosting complex made up of unique plant extracts. The key function is tyrosinase inhibition, the enzyme responsible for melanin synthesis or melanogenesis as it is commonly referred. An amino acid complex designed to protect DNA and repair already damaged DNA as well as prevent and revere glycation. Vitamin C - a stabilized super-hybrid lipid soluble form of vitamin C which delivers 50 times better than ascorbic acid (regular vitamin C). It reduces melanin synthesis, increases collagen synthesis, and is a great acne treatment. Hematite - a mineral from effusive magma rock in hydrothermal seams, which stimulates enzymatic activity inside the cell, increasing production of pro-collagen (a precursor to collagen). Rhodochrosite - a mineral first discovered by the Incas in the 13th century, has extraordinary cell protection capabilities as well as is necessary for the synthesis of proteins, haemoglobin, and lipids. SOD (superoxide dismutase) - an enzyme that is also a powerful anti-oxidant and anti-inflammatory that repairs cells and reduces the damage done to them by superoxide, the most common free radical in the body. Also provides environmental protection to the skin. Saccharomyces Ferment derived from yeast, provides powerful DNA and lipid barrier protection, as well as anti-wrinkle effects. Sodium PCA - a naturally occurring component of human skin residing in the epidermis for the purpose binding moisture to our cells. Ours is derived from plant sources and is a highly bioactive moisturizer, humectant, and emollient. Sodium Hyaluronate (Hyaluronic Acid) - occurs naturally in the deeper layers of our skin (the dermis). It helps to keep skin smooth and "plump" through its ability to hold up to 1,000 times its weight in water. Ours is derived from plant sources and is a powerful bioactive moisturizer, humectant, and emollient. Trehalose - a plant derived substance that has high water retention capabilities as well as the ability to bind moisture to our cells. Trehalose also has the ability to prevent glycation. Perfluorocarbon, an organic compound, is a catalyst for oxygen. It increases oxygen and moisture levels in the skin as well as increases skin and cellular respiration. WOW $170!! I hope this works for you Whit!! But the claims do sound promising!